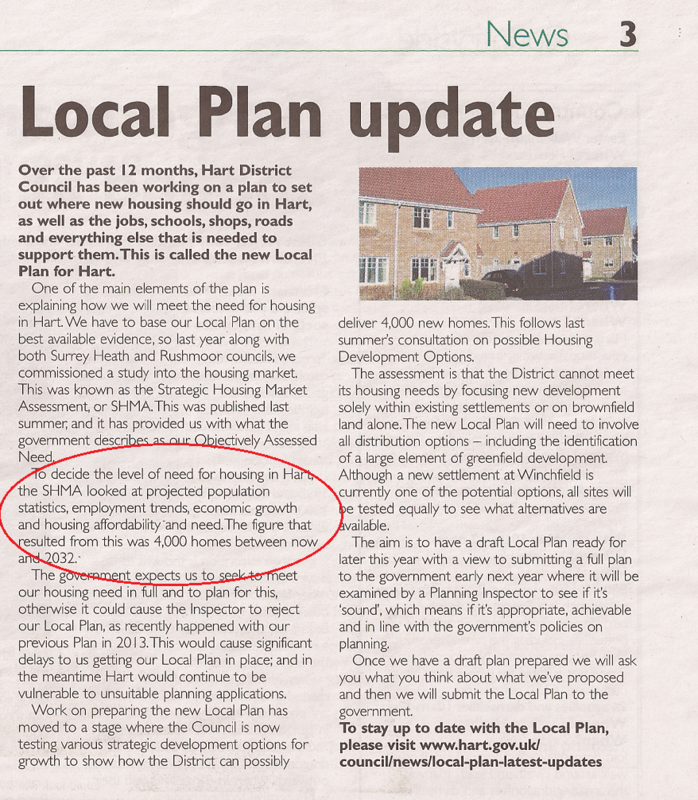 Hart District Council has published an article in the latest copy of Hart News that gets its facts wrong on how many houses we have to build under the emerging Local Plan. As can be seen from the above image, Hart Council is saying we only need to build 4,000 houses up to 2032. However, this is in direct contradiction to the strategic housing market assessment and the evidence presented to Cabinet back in November 2014 that clearly states we need to build 7,534 houses in the period up to 2032. Even 7,534 houses is probably an understatement, because Rushmoor Borough Council and Surrey Heath Borough Council have told Hart that they cannot build all of their allocation on their own patches and want Hart to build a further 3,100 houses for them. This would give a total of 10,634 houses to be built in Hart up to 2032. Hart’s strategy of building a new settlement (option 4) in Winchfield creates additional capacity that makes it much more likely that we will have to take these additional houses. The article in Hart News also further illustrates that Hart is not serious about its brownfield strategy as they are continuing to ignore the large number of vacant office blocks and sites such as Sun Park and Hartland Park and are still assuming only 30 dwellings per hectare. Furthermore, they make no mention of the need to build specialist housing for our ageing population which a new town won’t deliver. Finally, Hart Council were supposed to be consulting on the draft plan now, with a view to modifying it during the Summer before publication of the actual plan for a further round of consultation in the Autumn. But now they have skipped one of the consultations. We can only speculate as to the motives behind this mistake and the skipping of one round of consultation. However, it is difficult to avoid the conclusion that Hart District Council are hiding the truth, and trying to push through a disastrous strategy without proper consultation. Posted in Hampshire, Hart District Council, Hart Local Plan, Hart SHMA, Risk of becoming sink for Surrey Heath and Rushmoor, We Heart Hart Campaign, We Love Hart Campaign and tagged Hampshire, Hart District Council, Hart Local Plan, Hartland Park (Pyestock), Risk of becoming sink for Surrey Heath and Rushmoor, Rushmoor Borough Council, Surrey Heath Borough Council, We Heart Hart Campaign, We Love Hart Campaign.